Those who know me well also know that, since the beginning of my artistic endeavors, human presence has been almost entirely absent from my exclusively nature-based artwork. While this was primarily a reflection of my artistic interests, I began to realize (after years of making my home amidst some of the best figurative artists alive today) that my interests were expanding, and any avoidance of the human figure now was largely due to lack of knowledge or ability on my part. Since I, as a rule, try not indulge in fear-based decisions, I decided it was time to get busy expanding my skill set. The biggest help on this front was teaching figure-drawing classes. After a few semesters of auditing, I accepted a Life Drawing class, and whipped up an anatomy-heavy curriculum that would require me to stay in practice for the benefit of my students (I mean, really, it’s hard [for most] to convince yourself to spend 15 hours a week drawing muscle groups from memory solely for your own satisfaction). After a few semesters of teaching this class, I felt much, much more comfortable with figure drawing and a basic constructionist approach to the human head, but a sensitive likeness of particular individual was still something to which I’d never devoted any meaningful time. I decided to spend a few semesters auditing portraiture and figure painting with Hope Railey and Joseph Todorovich at Laguna College of Art and Design—an opportunity of immense value available to alumni and faculty of the school (though no small task while teaching five classes, mentoring, advising, tutoring writing, and working towards a solo show. Worth it though!). 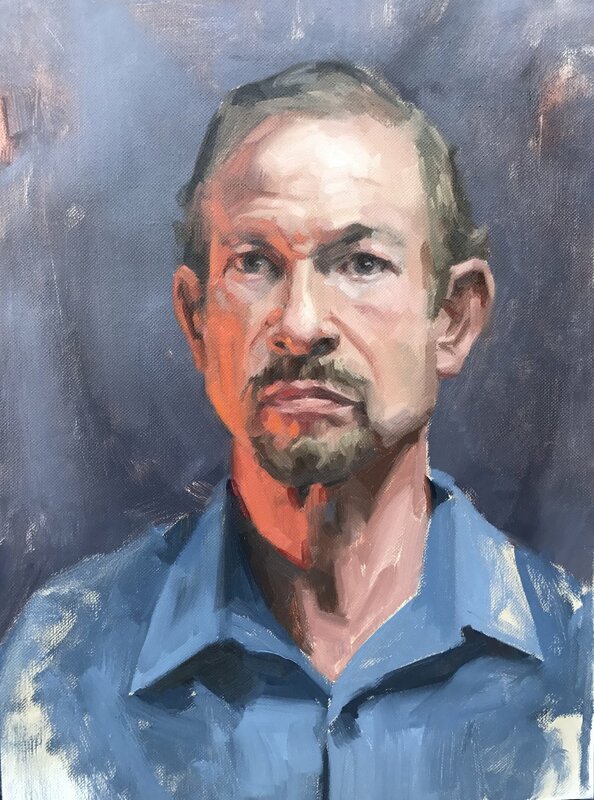 When I signed up, I was viewing it purely as a technical exercise, but towards the end of my first semester listening to Joseph wax rhapsodic about the nuanced beauty of human expression as we spent a day each week painting from life, my plans for my new skill set began to change. I had, I realized, never really painted anyone I knew before, just models in the classroom. 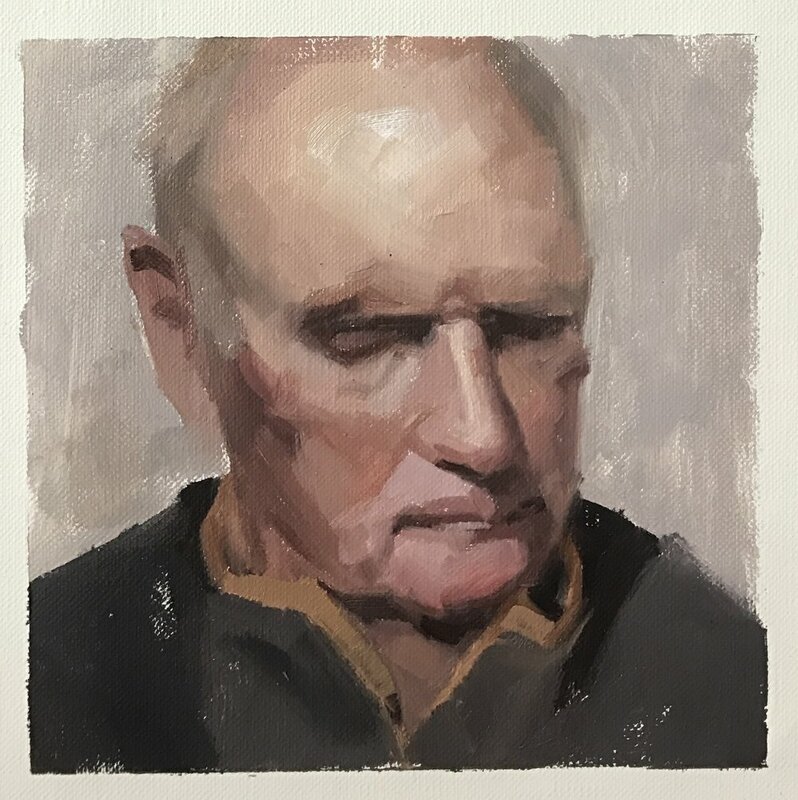 The first few familiar portraits were a dozen 30-40 minute quick studies in which I tried to wrangle form, light, proportion, and a vague likeness into submission in half an hour. The few that began to look familiar so excited me that I shortly began a portrait (not pictured) of a nice man I’d starting dating…little did I know that a short year and half later, we’d be moving into a home we purchased together while planning our wedding! The experience of painting a beloved face, or with other, later pieces, simply a familiar face--for which one develops that certain mystical affinity that characterizes any subject of sustained artistic attention—opened an entirely new and joyful realm to me. At the same time, I was falling deeply in love with oil paint. Though drawing will always be my first and truest love, there are so many ideas and possibilities that have been tiptoeing around in the back of my imagination for years…pieces that were simply not well-suited to charcoal or encaustic. There are things paint can do easily that other media cannot accomplish without great difficulty (or at all, in some cases). As I began to embrace these half-real, half-imaged landscapes and moments, I was forced to admit to myself that not only would my upcoming show include some portraits or figuratively-leaning work…but it would be composed entirely of paintings. I can’t help but feel that some of the creative constraints—realized or unrealized—under which I previously labored have been lifted. With versatility in media comes an unprecedented expanse of possibility. The only things holding any artist back are first, the constraints of their medium (with oils, very few), and second, the far more difficult constraints of their own skill set. But I’ve always made a habit of working at the edges of my own boundaries—how else do we coax them to expand? ?—and I look towards the future with great excitement as I work each day to keep my skill set up to speed with my imagination. I’ve included above a small sampling of these explorations, but I invite you to join us at Gallery 1261 this October when I will unveil the finished works, including the very recently completed painting below entitled In My Lady’s House (a little preview just for those visiting this blog post! Have to save some surprises for the show…).